Machiya are to Kyoto what red-brick Victorian mansions are to London or brownstones are to Brooklyn. These traditional townhouses, once owned by merchants and craftsmen, fuse traditional and contemporary design, usually in quieter residential areas, offering a more relaxing experience than tussling with tourists at the city’s main sites. To avoid the hoards that gather in Gion in favor of another ancient geisha district (though this one is no longer used for that purpose), head to Tambaguchi, an up-and-coming area now more famous for its fish market than maiko (apprentice geisha). Tambaguchi is full of local restaurants who wholly take advantage of their proximity to the city’s freshest offerings, serving up tasty dishes amongst authentic settings. 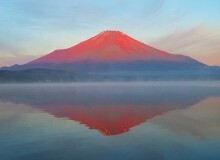 Uogashi Miyatake is one such place. 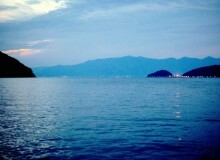 Miyatake gets fresh fish from the market daily and serves pristine sets of sashimi and sushi. Their lunch is a particular highlight with juicy cuts of fine fish, rice and miso served up for only ¥1,500. Dinner in the area is equally as impressive: Maker, a modern European style restaurant situated close to Saiin Station, has a rustic aesthetic of deep blue walls and heavy wooden furniture, including a large sharing style table proffering an interactive dining experience. The ambience is cool and the food even cooler. Savor as many of the seasonal sharing dishes as you can and wash it all down with a glass of natural wine or some homemade gin. One of the great joys of sightseeing in Kyoto is finding a secret spot, devoid of tourists, to truly bask in some tranquil appreciation of the hidden beauty of the city. Tambaguchi offers that in droves, yet is close enough to the city center that the famous landmarks are within easy reach if you feel the urge to tick them off. The area, and that of neighboring Shijo Omiya, are dynamic with a flourishing contemporary art and cafe culture scene, nestled in amongst the remnants of the former capital’s historic glory. 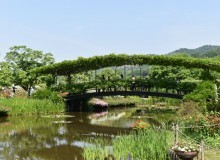 Try Hygge, the cafe at Kinse Ryokan and Mibu Mokuren, or Sumiya Museum as a fine example of the latter. An ancient ageya (restaurant where banquets and parties were held accompanied by the entertainment of geisha), Sumiya is the only surviving masterpiece of Edo period ageya architecture throughout Kyoto, Tokyo and Osaka. It’s any architecture or history-lover’s dream location, from which they can while away an hour or so. Those with a penchant for tradition can also seek out Mibu-Dera, renowned as the place that once served as the headquarters to the infamous Shinsengumi, a special police force formed of masterless samurai that protected the shogunate in a time of political turmoil in Kyoto. Now also known as ‘the temple of plays’ thanks to its mibu kyogen (short theatrical performances using elaborate costumes and masks to entertain the crowds), the venue hosts stories that are fun and farcical, taking place throughout the year. If you like your culture more contemporary, head to either BAMI gallery or the exhibition space at Art Hostel Kumagusuku, both of which show the works of young artists and creatives within refined settings. 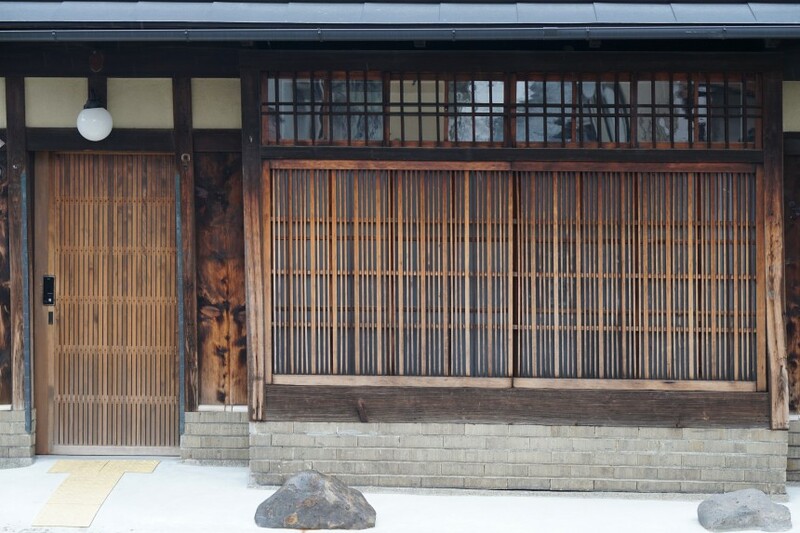 They provide travellers with new discoveries about a side of Kyoto that is completely different, yet nonetheless complementary, to the rich religious and cultural history. A great place to stay in the area is the beautifully-restored Maana. 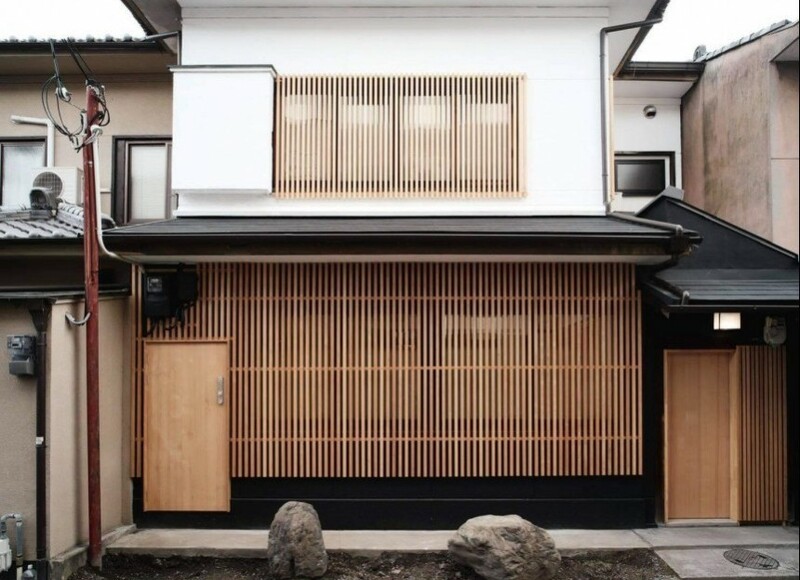 Set on a quiet residential street, every aspect of the design has been carefully thought out, from the minimal ikebana arrangement in the entrance, to the handcrafted Shigaraki-yaki bathtub overlooking the tranquil garden. 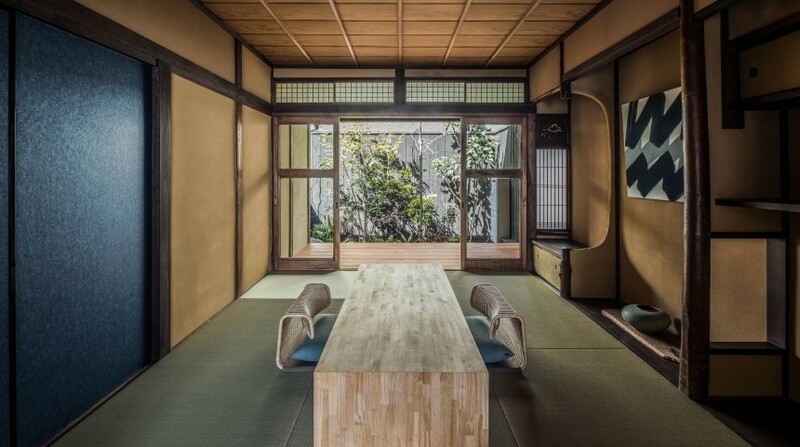 Hana Tsukamoto and Irene Chang, owners and former designers, were inspired by Kyoto’s simple but meaningful way of life and worked with acclaimed Kyoto architect Shigenori Uoya to renovate the 100-year-old house. Focused on creating a harmonious space, filled with modern amenities but sympathetic to the origins of the property, Maana is flooded by natural light, which glimmers off exposed earth walls and shoji sliding doors. The space is a haven of relaxation. The kitchen is open and airy, crying out for guests to sit and share a home-cooked meal around the minimal wooden island. The Wakabaya pottery pieces that decorate various rooms are the epitome of wabi-sabi and the ambience instilled by the glass lights of Kyoto’s Miura Shomei come together to create a truly inspirational stay. Another favorite, closer to the Shijo Omiya area, is a beautifully renovated post-war wooden machiya style guesthouse; Modern Machiya. Renovated to incorporate the minimalism found in both modernism and Japanese zen design, new fresh beams pop against original ceilings, and pounded earth walls are framed artistically against new ones. 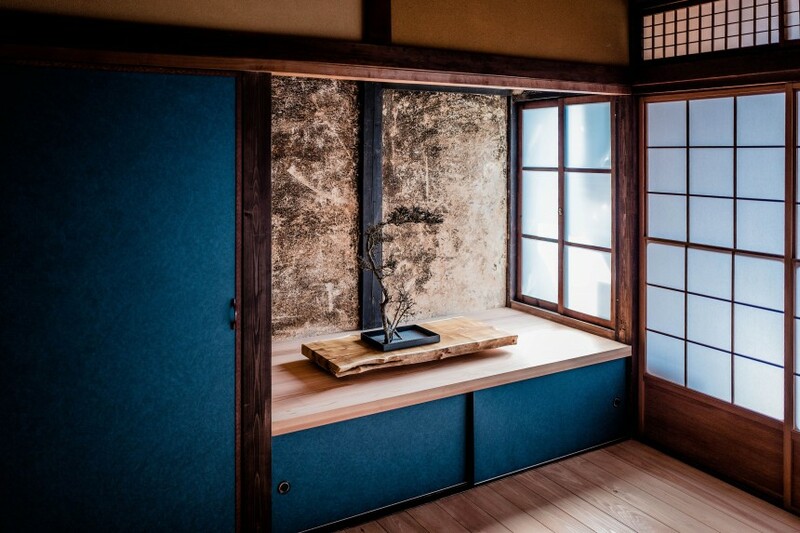 Vinyl record players create a soundstage within each tokonoma (alcove) and inspirational workstations can be found in engawa (verandah) next to open windows. 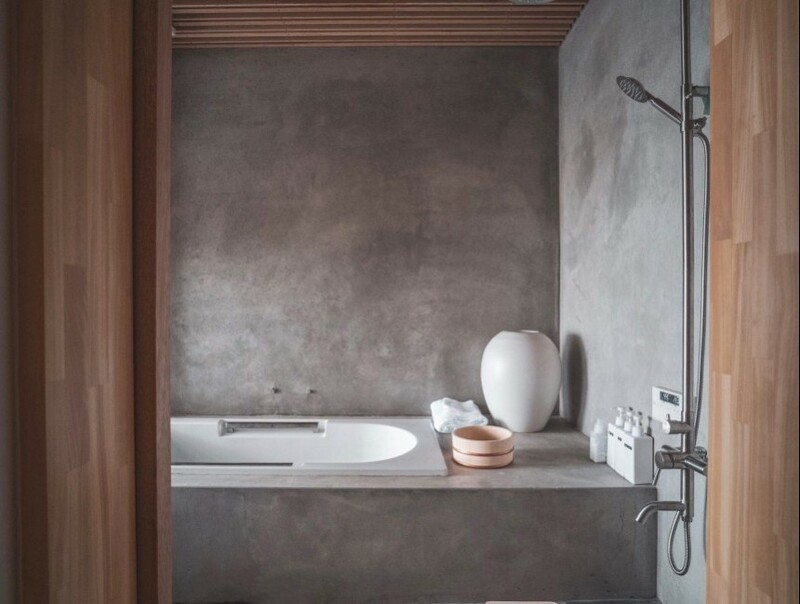 The brushed concrete bathtub is a nod to Scandinavian design and the bright airy living spaces are a welcome improvement from claustrophobic rooms that are often found in Japanese hotels. It’s a house that really does mimic the area; celebrating the old, whilst not letting traditionalism stifle creativity.